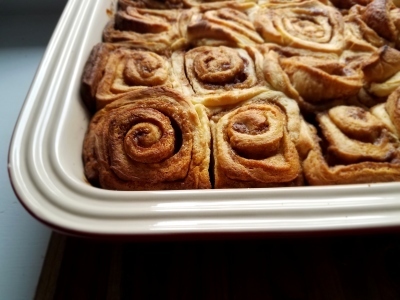 ​​These cinnamon buns are an annual Christmas morning tradition. I developed the recipe for a school event when my children were young, and it became such a family favorite that I began making them Christmas mornings. Nowadays we take turns preparing the dough on Christmas Eve. Sometimes my son will make the dough and my daughter will handle assembly, other years my niece or nephew take over. 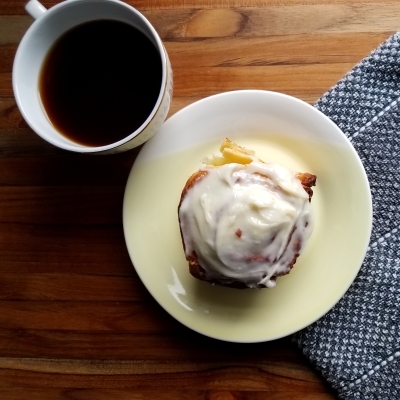 But every Christmas morning whoever is awake first pops them in the oven, so that we all wake up to the wafting aroma of cinnamon spice. The recipe will also work if you skip the overnight proofing but they are really best if you give the yeast time to develop more complex flavor. Trust me, they are worth the wait. Dissolve the yeast in the warm water and let it sit for 15 minutes. In a large mixing bowl or the bowl of stand mixer with a paddle attachment, cream the butter and sugar. Add the eggs one at a time, mixing in between. Add salt, yeast & water, and milk and mix well. Stir in flour until just combined (start with 4.5 cups, and add a little more if the dough seems too wet) and then keep stirring until the dough comes together into a smooth ball. I usually start stirring with a large wooden spoon or the paddle attachment of my stand mixer but switch to kneading with my hands after the dough has mostly come together. When the dough is smooth, transfer it to a lightly oiled/buttered bowl, cover the bowl tightly, and leave somewhere warm (you can leave the light on in the oven and put the covered bowl in there). Let it rise for 3-4 hours (it will double in size). Once dough has risen and doubled in size, it’s ready to be rolled out. On a lightly floured surface roll out into a large rectangle, about 1/4 inch thick. Try to roll it so that the long end of the rectangle is closest to you. Spread the dough with the softened butter. Mix brown sugar, cinnamon and pinch of salt in medium bowl. 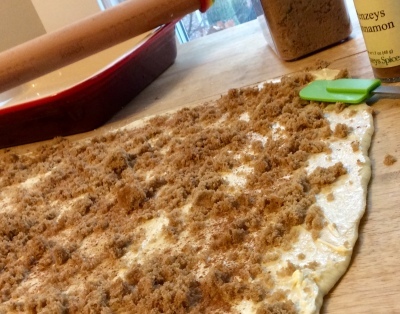 Sprinkle brown sugar mixture evenly over the dough. Starting with the long end closest to you, roll the dough tightly into a spiral, ending with the seam side down. Using a sharp, serrated knife, cut the log of dough into 1 inch sections and lay the buns in a lightly greased 9x13 pan. 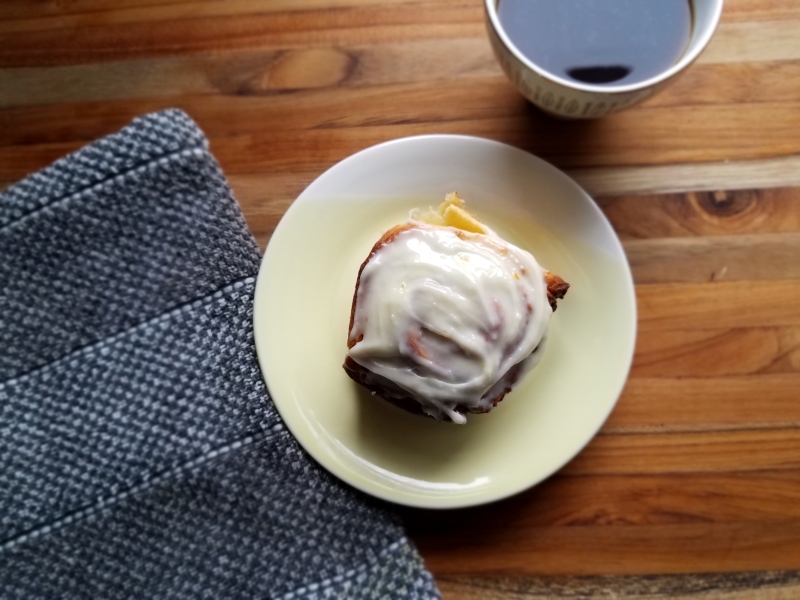 Do not overcrowd, it’s best if the buns have some room to expand. Use 2nd pan for overflow buns if necessary (usually we put 12 buns in the 9x13 and have 6 or so extras that we put in a little casserole dish or pie plate). If making ahead, cover pan with plastic wrap and place in fridge for up to 18 hrs. Just make sure that you remove the pan from the fridge about an hour before baking. If not making ahead, cover pan with plastic wrap and let the buns proof at room temperature for 1 to 2 hours, until the buns press together in the pan and looked poofed up. 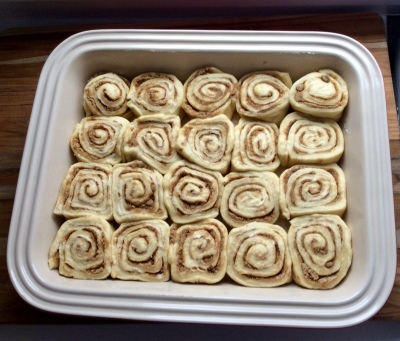 Bake cinnamon buns at 350 degrees for approx. 40-45 minutes, or until puffed and golden brown. If the edges look like they’re browning before the centers are baked through, cover pan with tin foil for the remaining time. Combine cream cheese, vanilla, salt, and zest with half of the powdered sugar in the bowl of a stand mixer with paddle attachment. Mix on low to moisten, then add in the rest of the sugar a little at a time. Once sugar is incorporated, increase speed to medium and beat for 5 minutes, until pale and creamy. Transfer frosting to a Ziploc bag. Frosting can be stored at room temperature for up to 24 hrs, or in the fridge until needed. 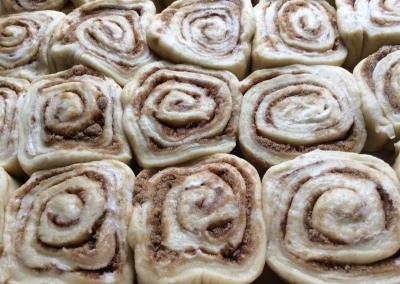 To use, just cut one of the corners of the plastic bag and squeeze the frosting over the cinnamon buns, spreading it into an even layer with the back of a spoon.